Canon’s PIXMA TS8152 is a compact designed all-in-one inkjet printer, that features for premium quality printing of documents and photos. The printer is efficient in carrying out a number of printing jobs and adds a touch of style to any workspace with its standout appearance. It incorporates 6 individual Canon Pixma TS8152 ink cartridges (including Photo Blue) for detailed colour definition and crisp text documents. Easily connects to iOS and Android devices with Wi-Fi and Bluetooth, this printer supports multiple wireless printing options. The printer has been designed with an economical footprint and space-saving design in mind. It measures 13.9 x 32.4 x 37.2 cm and has rounded corners and edges. With the elegant features, the printer supports auto 2-sided printing which means you can load photo paper (in the rear) and plain paper (in the front cassette) at the same time. It also supports SD card slot to print images directly from memory card and a USB port for wired printing. If you often print images or photos, the Canon Pixma TS8152 could be the right choice for you. This premium printer has six single inks, and promise to print superb quality pictures with vibrant and rich colours. It is a great asset for any home or office where the members can use the device for printing, scanning, and copying of documents regardless of who is using the computer. How to fix “Cartridge missing” or “Cartridge problem” for my Canon Pixma TS8152 printer? Make sure that the Canon Pixma TS8152 ink cartridges you have installed are compatible with your Canon printer. If the cartridges are not compatible with the printer, replace them as soon as possible. Power on your printer and open the scanner unit. Pull up the cartridge and remove it from the slot. Do not touch the ink nozzles, it may result in bad electrical connections or ink failures. Keep the cartridge at a slight upward angle and slide the cartridge into the empty slot. Close the lid to fit the cartridge into place. Install all the necessary Canon Pixma TS8152 ink cartridges. Close both access door and lid. Clean the electrical contacts of the cartridges and the printer. Open the scanner lid, the cartridge access door and detach the power cord. Don’t forget to disconnect the USB with your printer. Set the cartridge free. Lift the lid of the cartridge slot and push the lid back. Remove the cartridge from its slot and hold on to the cartridge from its sides. Use any soft material that does not leave fibres. Use purified/filtered water (do not use tap water, it contains impurities that can damage your printer). Damp a foam-rubber swab with the water you have collected and squash excess water from it. Clean the copper coloured contacts of the cartridge and keep it to dry for 10-15 minutes. Clean the electrical contacts of the carriage located inside the cartridge slot with a cotton bud. Hold the cartridge at a slight upward angle and move the cartridge into the empty slot. 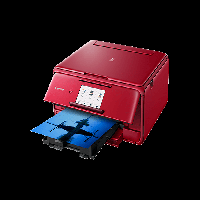 Perform previous steps to install another Canon Pixma TS8152 ink cartridges. Close the cartridge access door and the scanner top. Reconnect the power cord and the USB. Q. I have recently replaced my Canon Pixma TS8152 ink cartridges but I am not satisfied with the print result. What should I do? A. The unsatisfactory print results can be misaligned lines, white streaks, or uneven colours. You can check the paper and print quality settings to fix the issue. Q. Do you offer good quality papers for Canon Printer on your site? A. Yes, we offer good quality papers. Ink smear or smudge issue will not occur in a top-notch quality paper available on our site. Q. I had purchased Canon Pixma TS8152 ink cartridges from your site. But, now I want to replace the ink cartridges and purchase the cartridges for my Canon Pixma TS8252 printer. What should I do now? A. To replace the product purchased from our site, you can fill the form. For more information, you can read our return policy as well. Q. For the first time, I am purchasing compatible ink cartridges for my Canon printer. Will it affects my print quality? A. The print quality is not affected if the ink cartridge follows ISO Standard. If the ink cartridge is purchased from our site, then we can assure you that print quality/ printer warranty is not affected. As the ink cartridge on our site is FCS tested and certified. Q. I need to purchase Canon Pixma TS8152 ink cartridges in bulk. Do you deliver the product in Londonderry? A. Yes, you can make a bulk purchase from our site. We deliver our products within Republic Ireland & Northern Ireland. Q. What is the role of waste ink absorber in the printer? Does TS8152 printer has this ink absorber. A. The purpose of the waste ink absorber is to collect waste ink expelled during borderless printing on photo printers and cleaning of the print head. Yes, TS8152 printer contains waste ink absorber.